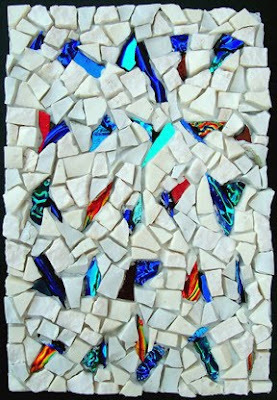 Margo Anton's Mosaic a Day: "Untranslated"
I always end up with little bit of leftover dichroic glass when I use it, and as it's very expensiveI can't bear to throw the bits out, but I haven't known what to do with them until now. Unfortunately this one didn't quite work out as expected. The "lettering" worked exactly as it did in my brain, but the background didn't. I think I'll try the concept (which I really like) again tomorrow, and see if I can improve it.